Moments ago we got the two latest monthly US manufacturing surveys in the form of the downbeat Markit PMI, according to which "the February data add to signs of distress in the US manufacturing economy", offset by the traditionally more optimistic ISM, whose chair Bradley Holcombe went so far as to say "US manufacturing may have found a bottom." Then overnight we also received the latest Markit manufacturing sentiment update from around the globe. Suffice it to say, it did not support Holcombe's cheerful "bottom hunting" outlook. 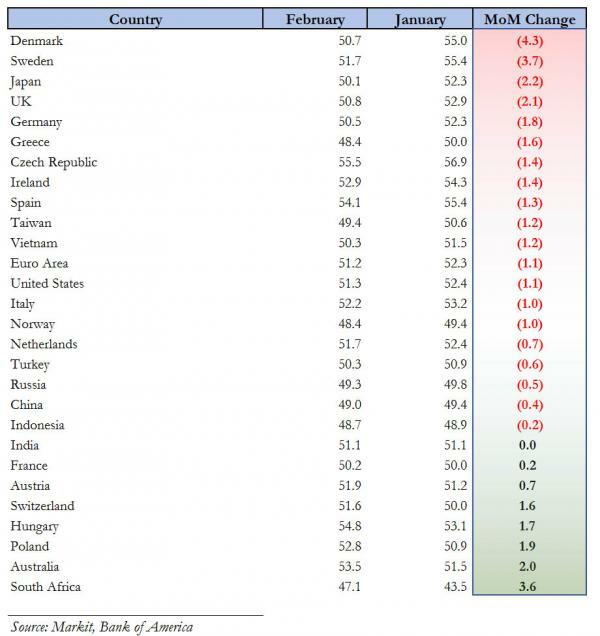 “The Global Manufacturing PMI posted at the stagnation mark in February, further highlighting the fragility of global industry at the start of the year. Inflows of new business and production volumes barely rose, while the trend in international trade deteriorated. The biggest wildcard remains China where economists note that the fall in headline PMI was mainly driven by declining production and new orders, while inventory of raw materials improved. The government ascribed the deterioration in the manufacturing PMI to celebrations surrounding the Lunar New Year, however as BofA notes, "growth momentum of industrial activities could have further weakened in February." Ultimately, the only relevant question is whether China can stabilize its economy, and lead to a recovery in global manufacturing which for the past 7 years has ultimately been a downstream function of how well China is doing. For now the answer remains nebulous at best.